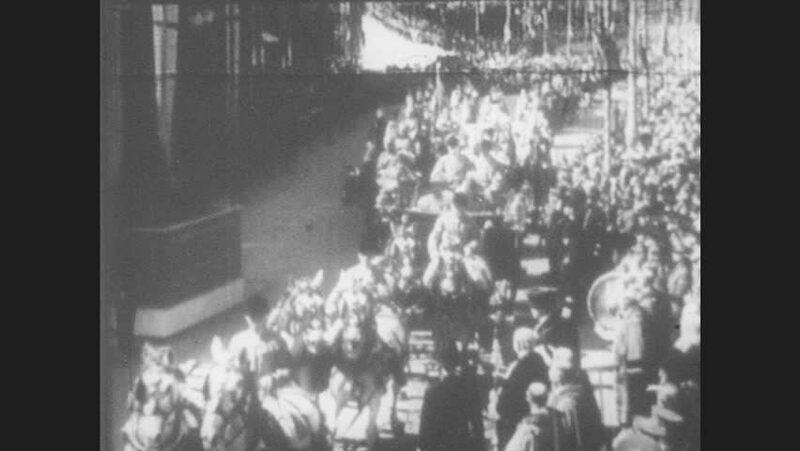 1950s: King George V rides on a royal horse drawn carriage in parade and in a casket as soldiers pull the funeral procession down street. hd00:17UNITED STATES 1950s: View of forest from river / Man carries dead bird / People planting plants / Closer view, person planting / Globe with equator line. hd01:11CIRCA 1915 - An actress and her leading man compete in a foot race, colliding with a cowboy who is walking and viewing a postcard with a picture of the actress on it, in Prescott, Arizona. hd01:32CIRCA 1921 - Officers and officials watch a parade of soldiers and mounted troops in Germany. sd00:411900s: A facially disfigured soldier wears a prosthetic chin, in Paris, France, in 1918.
hd00:191950s: horse drawn carriages, men and women jam London street in 1901. portrait of Queen Victoria of Great Britain.